Qanats were studied in the mid-1990s in Syria as pan of a broader project examining the role of qanats in a modern world. Fieldwork was conducted in winter 1993 and summer 1994 in order to determine the distribution and status of qanats throughout Syria evaluate the historic role of these qanats, determine why qanats were built where they were, why their use has so dramatically declined in recent decades, and what impact these changes have had on Syria's ground-water resources. Empirical and secondary data were collected from documents, field reconnaissance (qanat visits and tunnel exploration), and interviews with resources officials, felaheen (peasant/farmer) union members, and mukhtars (town or village advisors). A map produced by this research, showing the distribution and status of qanats across Syria, presents a picture of widespread abandonment of qanats, many of them quite recently desiccated, implicating ground-water depletion and underscoring the need for coordinated and sustainable aquifer management (Fig. 1). As part of this study, 67 qanat sites throughout Syria were identified and visited, comprising a total of 239 individual qanat galleries. Only 12% of Syria's qanats (29 qanats at 16 separate sites) still flow, and most of these are on the verge of drying up, producing water discharge rates only 10-30% of pre-1960 flows. 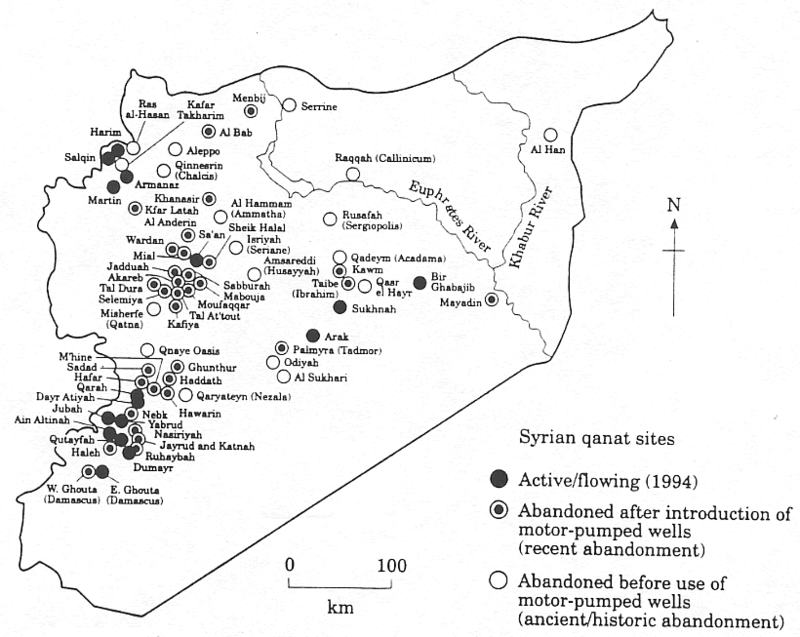 Of the 210 separate qanats that have now dried up, 193 of these (92%) have ceased flowing since the introduction of pumped tube wells, and most of them since the mid 1970s when pumped wells began to expand exponentially across the Syrian landscape. Figure 1. Distribution and status of Syrian qanats (as of 1994). Qanats have been used in Syria to irrigate fields and gardens for centuries, and many of these - especially around Damascus, Selemiya, Palmyra, Qadeym, and Taibe - have been examined in some detail in published reports. There are many others scattered across the Syrian landscape which have never been described in written accounts, yet nevertheless have provided an important source of irrigation and drinking water for dozens of isolated settlements, even in areas where no surface water is available. Existing records show that qanats were in use in Syria (and elsewhere in the Roman world) by Roman times, about 2000 years ago (Caponera, 1954, p. 45), and Syrians still refer to these features as 'qanat Romani' (Roman canals). So we know that there were qanats in Syria at the time of the Romans, but that doesn't mean that all Syrian qanats were built by Romans and then cleaned/maintained from that time forth. The diversity of qanat types seems to reflect a great variety of origins. For example, engineering and architectural forms associated with qanat shafts and vent openings are not consistent (e.g. masonry or dirt in shaft and around vent shoulder; variations in diameter and spacing), qanat tunnels vary widely in design (e.g. height and width; oval to rectangular profiles; natural interior or various forms of wood, masonry, brick, or cement casing; continuous gradient vs. the floor of the tunnel excavated to create one or more subterranean reservoirs in line with vertical shafts), and the water may exit to flow into a canal, a birka (small reservoir or holding tank for irrigation water), or a large well. Syrians today refer to all qanats as 'Roman canals', or 'qanat Romani'. The term 'Romani' in Syria is commonly applied to Roman features, but it can also be interpreted to mean 'pre-Islamic' or simply 'old', and not necessarily 'Roman'. There is some evidence that the first Syrian qanats were pre-Roman. Some historians have maintained that the Hailan-Aleppo qanat, a 12-km long subterranean channel which still functioned until the early part of this century, is coeval with the Aramaeans and their fortress at Aleppo (13th century B.C.) (Russel, 1794, p. 42). However, this is highly unlikely as the best evidence (archaeological and written accounts) suggests that qanat irrigation was first invented in the Armenian-Persian region about 600-700 B.C. Some scholars have suggested that qanats were originally introduced in Syria by the Persians, when Syria was incorporated as a province within their empire in the 6th century B.C. Persians had already used qanats nearby to open up the water supply for Egypt's Kharga Oasis by about 500 B.C. (Forbes, 1964, p. 183), and ancient Persian potsherds found inside qanats in the Arava Valley, in the Israeli Negev, suggest that these qanats were first constructed during the Persian rule of the Holy Land (537-332 B.C.) (Evenari et al., 1971, p. 178; Ron, 1989, p. 219). 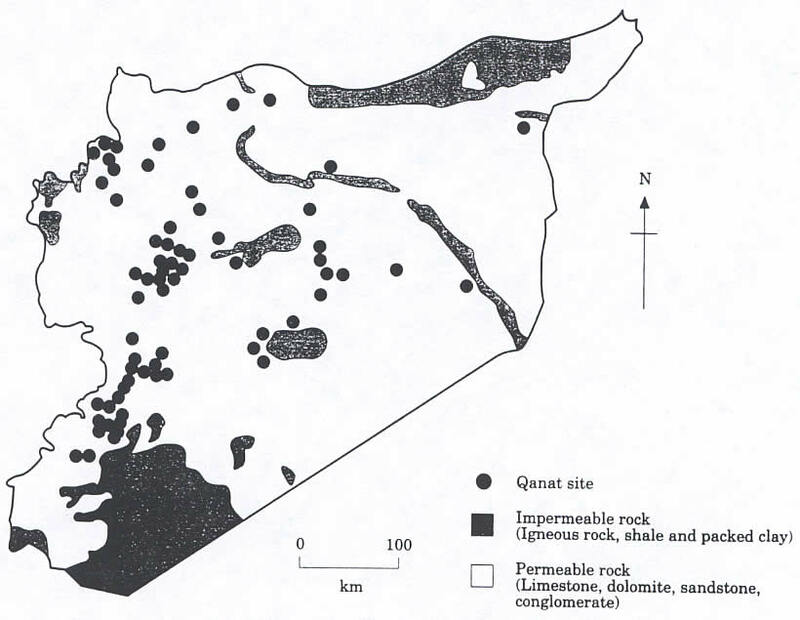 Goblot (1979, p. 132) asserts that, regardless of who later built the majority of Syria's qanats, this technology had already been transferred to the area by at least the 2nd century B.C., placing qanats contemporary with the Greeks in Syria. A historian from Selemiya (Syria) maintains that the first qanats in that area were built by the Greeks (with most of them built later by the Romans) (Amin, 1993, pers. comm. ), though evidence for this is circumstantial and not artifactual. The Greeks adopted Near East water technologies and freely applied them where they settled; the first conduit supplying Athens with water from Mt. Pentelicus was a qanat-type channel (Sandstrom, 1963, p. 60; Forbes, 1964, p. 164). That the Greeks borrowed this technology from the Persians is almost certain; that they applied it to Syria and built qanats there is not. There is no material evidence that the Greeks -or the later Hellenized Seleucids - constructed any of Syria's qanats, and few places in Syria settled during the Greek or Seleucid periods are even near qanats. It is certain that many of Syria's qanats were first constructed during the Roman- Byzantine era. The Romans (64 B.C. to A.D. 330) and their eastern Roman empire successors, the Byzantines (A.D. 330-630) gave Syria a great number of aqueducts and wells, many of which are still in use, and generally improved irrigation techniques and expanded arable land in the region. Numerous pottery fragments, oil lamps, and other artifacts found in qanats have clearly shown that qanats in this region date from Roman times (Reifenberg 1955, p. 54; Puller, 1986; Fuller, unpublished Ph.D. dissertation). Other archaeological evidence (e.g. inscriptions, putei (surface shafts), Roman wells at qanat termini) and historic records show that the Romans constructed qanats in Syria, Jordan, Tunisia, and other places throughout their empire (Caponera, 1954; Goblot, 1979; Fuller, 1986, 1987; Fleming & Barnes, 1993). 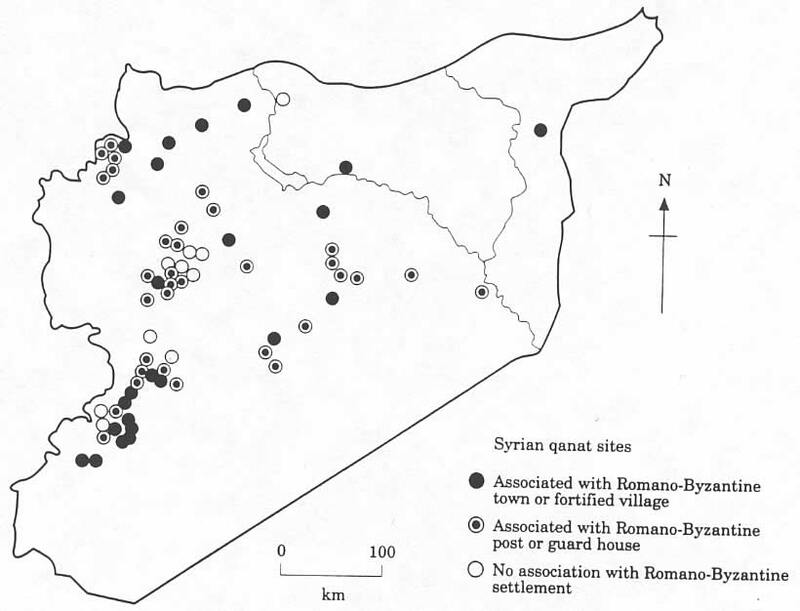 Syrian qanats also show a high degree of spatial correlation with Roman-Byzantine sites. Almost 40% of these qanat sites are found within or adjacent to (former) Romano-Byzantine towns or fortified villages, and another 50% are sited in the immediate vicinity of smaller Romano-Byzantine outpost or guardhouse ruins (Fig. 2). Because the supporting evidence is strong, most scholars believe that the majority of Syrian qanats were first built by the Romans and Byzantines in the first to seventh centuries. There exists good evidence that some of the qanats we see in Syria today were built by other (post-Roman/Byzantine) groups during periods of relative prosperity (Moussly, 1951, p. 146). Although many qanats in Syria are located near Romano- Byzantine outposts or guardhouses, it is not likely that very labor-intensive qanats were routinely built to supply drinking water or support agriculture around these small, often temporary outposts. Furthermore, a few qanats in Syria exhibit no association with arable land in the immediate vicinity of Roman or Byzantine sites, offering further evidence that some of Syria's qanats were built by post-Roman, Islamic groups. A number of scholars have attributed some of these qanats to the Umayyad caliphate (A.D. 661-750), when the Islamic empire was at political and geographical zenith (Sourdel, 1968; Goblot, 1979; Kobori, 1990). Damascus, as the capital of this empire, achieved a glory unrivaled among cities of that period, Syria became the most prosperous province of any Islamic caliphate, and agricultural production was expanded throughout much of the region (Goblot, 1979, pp. 127-132; Collelo, 1988, p. 10). Most of the sites associated with qanats were occupied and farmed during this period, and Umayyad architecture was added to that of the Romans and Byzantines at Damascas, Aleppo, Rusafah, Qasr el-Hayr, Hawarin, and other places in Syria where qanats are found (Sauvaget, 1939). The Umayyad contribution to Syria's qanats is further suggested by interior tunnel casings and birkas (reservoirs) of 7th century Umayyad design at qanat sites around Amsareddi and Qasr el-Hayr, among others (Kobori, 1990, pp. 323-324). By A.D. 750 the Islamic Abbasids had conquered the Umayyads and established the caliphate in Baghdad. Syria was reduced to a province within this empire, yet the Abassids continued to develop Syria's resources (Goblot, 1979, p. 129; Collelo, 1988, p. 12). These Islamic empires brought Syria into frequent contact with Persia(ns) - where qanats originated and where they were still being built in great numbers - which surely contributed to the post-Roman construction of qanats in Syria, and Islamic peoples are known to have built qanats in other parts of the Middle East and North Africa in the post-Roman era. The diffusion and historic utilization of qanats in the Old World -from the Iberian peninsula to central Asia -mirrors the historic dispersal of Islam. Once built, these ancient qanats were sometimes maintained throughout the centuries by periodic cleaning (removal silt/debris from the qanat tunnel in a schedule which varies according to the soil and configuration of the land), repairing the well entrances and shafts, and sometimes deepening the mother well or extending collecting galleries further into the aquifer in an attempt to increase the flow of qanats. In other cases, Roman-Byzantine or Umayyad-Abassid qanats fell into disrepair as these empires waned, only to be cleaned and repaired at a later date as people moved back into abandoned sites; refurbished with funds from state or local administrative coffers, or (more often) through the efforts of village cooperatives or wealth) landowners. Some of Syria's qanats were repaired and extended in the 1930s by the Mandate French authorities. A few of the many qanats around Selemiya may even have been built in the late 19th century by Ismailis (a Shia Islamic sect) who settled in the region in the 1870s (Lewis, 1949, p. 286; English, 1968, p. 176). Some landowners within the Ghouta of Damascus have not only continued to preserve and operate ancient qanats but, at least as late as the early 20th century, constructed new qanats (Tresse, 1929; Goblot, 1979, p. 127). Because qanats must be constantly repaired in order to maintain water flow, the appearance of a qanat may change over time, as tunnels are reshaped, shaft openings are lined with masonry or bricks, or birkas are incorporated into the qanat channel or at its terminus. While some of these additions are clearly recent (and documented as such), many historic modifications cannot be distinguished from original qanat construction. As culture after culture replaced the one which preceded it, each added its own qanats to those already built, and/or refurbished earlier qanats according to its own designs, leading to the great variety of engineering and architectural forms we see in the qanats today. Many of Syria's qanats lay abandoned for centuries; early European travelers to Syria described dead qanats in accounts of their 18th and 19th century travels (Creswell, 1932, p. 342; Goblot, 1979, p. 128). Many more have been abandoned in the latter half of this century as water tables have fallen since the introduction and widespread use of electric and diesel-pumped wells. Figure 2. Relationship between qanat sites and Romano-Byzantine sites. Regardless of who built qanats in any region of Syria, they were all constrained by the same physical environment which limited useful qanat construction to a relatively small number of locales. In the following sections the relationship of qanat sites to rainfall, evapo-transpiration, topography and geology will be examined, to see if there are any consistent patterns in the siting of Syrian qanats, in order to understand why early engineers built qanats where they did. Most qanats in Syria (75%) were constructed within semi-arid regions receiving 100-300 mm average annual precipitation, and all are found at or below the 500 mm isohyet. This also mirrors the pattern in Iran, where the major qanat systems are found where precipitation totals range from 100-300 mm per year (Beaumont, 1989, p. 27). People in wetter areas - where perennial streamflow is adequate - rarely built qanats, and drier regions were inhabited by nomadic Bedouin herdsmen not inclined toward irrigation-dependent sedentism. In this century, however, many Bedouin have moved into permanent settlements and have refurbished or re-opened some long-abandoned qanats in eastern Syria. Regardless of incoming precipitation, the potential for evapo-transpiration (Et) will affect the evaporation of surface water, so areas with increasingly higher potential Et would gain an incrementally greater advantage by relying on the subterranean waters of a qanat. Annual precipitation is lower than potential Et throughout Syria - i.e. the entire country experiences water deficit - and the driest areas of the country, with the greatest discrepancy between incoming precipitation and potential Et, are where qanats are found in abundance. Qanats were mostly built within the region of 1600-2800 mm potential Et and where potential Et is 4 to 20 times greater than average annual precipitation. Almost one-half of the qanat sites are found in hyper-arid regions where potential Et exceeds precipitation by a factor of 10 to 20. The chain of wells associated with a qanat usually runs across relatively flat terrain, though often adjacent to, or even surrounded by, mountains or hills. Qanats commonly tap into shallow aquifers (alluvial fans or synclinal bedrock) at the base of these hills or mountains, or along the margins of larger wadis (stream channels) coming out of the mountains. Therefore, there is a close relationship between qanats and mountains/hills; almost 90% of Syria's qanat sites lie within 25 km of uplands, and 75% lie completely within piedmont slopes at elevations of 500 to 1000 m. Some of the qanat sites which appear beyond the piedmont zone actually lie at the base of low escarpments. Furthermore, the collecting galleries of qanats at the base of larger hills/mountains often tap into water tables adjacent to the large wadis which flow out of these highlands, so there is a great mix of piedmont and wadi aquifers feeding all of these qanats, yet each of these aquifers is recharged with precipitation primarily falling in the uplands. Where ground-water water is available farther out from the uplands, it tends to be brackish and otherwise of poorer quality than water found in or very near the mountains, where the water has not yet been adulterated by salt, silt, or other impurities. Thus, the uplands supplied qanats with both a greater quantity and quality of ground-water, and they were rarely built beyond the montane-piedmont zone. To ensure long-term, perennial flow from a qanat, and thus an adequate return on the investment in time and money required to construct qanats, they were constructed to exploit aquifers that are seasonally recharged. These aquifers usually are shallow - a few meters to tens of meters deep -and located in areas of permeable rock, thus allowing regular recharge to the aquifer below. Qanats were not built in regions with impermeable surface materials. In most of the steppe and desert regions of Syria, deposits of calcium carbonate and silica form impervious layers beneath the permeable marly and calcareous formations nearer the surface (Reifenberg, 1955, p. 53). It is in regions with these conditions that the Roman and Islamic empires exploited the water-bearing strata to build qanats; tunneling most of their qanat channels through solid beds of chalk and limestone. The nature of the subsurface waters tapped by a qanat can, and has, changed. Land reform and the infusion of new technology have, since the 1950s, radically changed water needs and perceptions regarding the utility of qanats. Heavily irrigated export crops and poorly regulated tube wells have led to rapidly falling water tables. There are many reasons why a qanat may fall into disuse; some physical, others purely social or economic in nature. In the end, environmental and cultural forces all converge to replace the old with the new, and qanats continue to be abandoned as a result. The inside of old qanat tunnels may become choked with calcareous deposits, and/or the interior of the mother well and feeder wells become coated with mineral deposits, which reduces water seepage from the aquifer. Qanats may be abandoned if they are severely damaged by earthquake or flood, or if a major portion of the channel collapses during cleaning operations - which is increasingly common where dynamite has replaced picks and shovels for qanat maintenance (more prevalent in the Maghreb than the Middle East). More commonly, qanats are abandoned as the water table falls, which in recent times has resulted as newer and expanded irrigation systems have over-used ground- water. This has occurred not only in hilly areas where qanats tap into small, perched aquifers, but even across expansive plains (e.g. the Selemiya Plain, where large, regionally-scaled aquifers, now severely drawn down, once fed an expansive qanat network) .The greatest impact on qanat systems worldwide has been the introduction and widespread use of the pumped tube well, mostly since the 1950s. Electric and diesel-pumped wells offer advantages over qanat irrigation by allowing water to be brought to the surface on command, and the depth of tube wells can be easily extended to increase the supply of water during droughts. But exponential growth in the number of pumped wells has, in recent decades, induced its own form of ground-water drought. Overpumping from tube wells has caused water tables to fall and qanats to be abandoned at an accelerating pace in Pakistan, Iran, Oman, Jordan, Syria, Morocco, and many other places (Beaumont, 1968, 1973, 1989; Kobori et at; 1980; Allan, 1982; Birks, 1984; EWers & Saidi, 1989; Achakzai & Toor, 1990; Safadi, 1990; Simarski, 1992; Lightfoot, 1996, in press). Many of the people interviewed at qanat sites in southern Syria (roughly from Ghunthur and Qaryateyn to Damascus) attribute qanat desiccation to a combination of overpumping and diminished rainfall. Annual rainfall in this Anti-Lebanon Mountains region of Syria has slightly diminished since the 1960s, reducing recharge to aquifers east of this range. However, while a more 'normal' rainfall rate would certainly have reduced the impact of overpumping on qanats, it could not have prevented some diminution of flow and at least limited desiccation in this region where the unchecked growth of diesel and electric-pumped wells expanded from a few dozen in the 1950s to about 6400 in the 1980s (about 3900 in the Ghoutas of Damascus and another 2500 in the region from Ghunthur to Haleh (see Fig. 1). Figure 3. Relationship between qanat sites and surface geology (permeable vs. impermeable materials). Qanat irrigation often expanded coincident with the growth of ancient settlements. Smaller settlements, supported originally by perennial surface streams or springs, sometimes augmented their water supplies with qanat waters, becoming larger and more prosperous as each new qanat tunnel allowed them to increase agricultural production, commercial activity, and even political power (Huntington) 1945) p. 540). When sites associated with the construction of qanats disappeared (e.g. because the Roman-Byzantine or Umayyad-Abassid settlements broke down as these empires waned), and the routine maintenance required to keep qanats flowing ceased) they were abandoned. More recently) the adoption of newer technologies has altered the political and social land-use patterns which evolved through historic reliance of villages on qanat waters. For example, qanats and their waters are usually publicly operated and collectively maintained (Caponera, 1954) p. 46) p. 84; Sutton) 1984) p. 9; Dutton) 1989; Achakzai & Toor) 1990, p. 289; Lightfoot, 1996). Intricate relationships have evolved to manage these waters and distribute them according to each individual shareholder's inputs of land, labor, tools, and money. Mechanically-pumped wells are often privately owned, and, as a result, the traditional 'ties that bind' in village society are breaking down. Furthermore, the majority of qanat shareholders are small landowners who do not possess sufficient resources to complement the scarcity of qanat water by excavating tube wells (Achakzai & Toor) 1990) p. 289). Yet many land owners and farmers now widely prefer pumped wells and allow their qanats to languish. This scenario has effected change in Syria, where new land reforms since the late 1950s have redistributed property and improved the security of land tenure (except for the bourgeoisie), thus increasing the number of farmers and farm cooperatives, and encouraging capital improvements to farm lands (Keilany, 1980). The result has been a rapid increase in the number of electric and diesel-pumped tube wells, and an expansion of surface irrigation systems, fed mostly by the Euphrates, Khabur, and Orontes rivers. Most of these newly irrigated lands are found in eastern and southern Syria, where annual precipitation is less than 200 mm, where wheat and barley are now produced for export, and in the 200-400 mm isohyet zone of central and northern Syria where cotton production has increased geometrically. Landowners of the village where qanat waters arise may be loath to let the water flow away to the lands of another village, and may favor replacing qanats with more localized schemes, such as pumped wells, so that they, and not others, derive benefit from the waters which lie beneath them. In effect, the traditional sense of water resources management for the benefit of the community seems to be giving way to an 'every man for himself' mentality. Communities that depend on ground-water supplies, and have been able to sustainably manage these resources for centuries, could -and should -incorporate an element of cooperative water management into their modem schemes. Finally, non-farm sources of income continue to draw people away from the villages, which disrupts the social organization of qanat systems (Birks, 1984, p. 29; Suttorn, 1984, p. 11; Achakzai & Toor, 1990; Lightfoot, 1996). For example, as more of the working-age men move out of villages in search of higher paying jobs elsewhere, membership in the cooperatives responsible for qanat maintenance dwindles to a few, dozen (mostly) elderly men, and qanats silt up or otherwise fall into disrepair. Once a qanat dries up or is reduced to a useless trickle, (whether for physical reasons - the water table falls - or for socio-economic reasons which reduce or halt qanat maintenance), the qanat is abandoned. However, qanats that have not yet collapsed have sometimes been repaired and reused decades, or even centuries, after abandonment. For example, many of Syria's qanats were abandoned as the frontier of settlement and agriculture in the region retreated westward after the l0th century, yet the qanats of the Selemiya Plain - where roughly one-half of the qanat galleries of Syria are found - were still being praised by Arab geographers as late as the 14th century for the purity of their water (Furon, 1967, p. 62). Tamerlane ravaged all of Syria in 1400, yet the qanats of Selemiya were again being protected and maintained by the late 15th century (Furon, 1967, p. 62). In 1516 the country fell to the Turks and for the next four centuries Syria slowly decayed (Lewis, 1949, p. 285). The qanats of the Selemiya region were abandoned and were not cleaned and used again until the late 1800s when pioneering Ismailis, settling on the Selemiya Plain, and immigrant Circassians settling north of Selemiya, cleaned and repaired as many as 125 old qanat galleries to provide water for irrigating 1240 ha (Lewis, 1949, p. 284, p. 286). By the 1950s diesel-pumped wells were growing in popularity in the Selemiya area, especially as a means of expanding water supplies for irrigating cotton, and the qanats of the region began drying up as the water table fell. Today, about 5000 mechanized wells pump water to irrigate 36,000 ha around Selemiya. As a result, the water table has fallen from 1-3 m depth (1950) to 10-30 + meters (today), and all 125 qanats of the Selemiya Plain have either dried up or been reduced to a useless trickle. Only five qanats in the region still flow, albeit with diminished and inintermittentlow; all of these are found around Sa'an, where a small dam and reservoir 2 km north-west of the town helps to recharge the aquifer in the immediate vicinity of these five qanats. Qanats at Taibe oasis (eastern Syria) also were probably abandoned along with the village after Tamerlane's rampage through Syria in 1400. These qanats were refurbished in the 18th-19th centuries during the Turkish (Ottoman) occupation (1 the region, but were abandoned again as the Turks departed in 1917. They were once again refurbished when Bedouin families settled in Taibe in 1940 but were abandoned in 1952 when new diesel-pumped wells drew down the aquifer which fed Taibe's qanats. One qanat (of four) was later opened that same year by digging deeper collecting wells (Kobori, 1980, pp. 12-14; Kobori et at., 1980, p. 53). The last operational Taibe qanat was once again abandoned in 1987, after a flood choked it with sediment; it has been replaced with new diesel-pumped wells (Kobori, 1990, p. 323). This cycle of qanat use and abandonment has occurred at other qanat sites particularly at those sites in central and eastern Syria that have remained on the frontier of settlement and agriculture. Because qanats have been the key to life in many settlements, numerous laws have been developed to regulate their construction and use. The expansion of old qanats or the construction of new ones must be done in such a way that the flow of water in existing qanats will not be diminished. The initial installation or placement of modern water-pumping devices is usually controlled by these same traditional water laws, often based on shari'a, or Islamic law. For example, harim - the area around each well which is protected so that new wells will not affect the yield of existing ones - is prescribed for tube wells just as it is for qanat mother wells. But the protected harim area for qanat wells is much greater - usually about six to eight times greater in radius - than that for tube wells, legally permitting a much denser concentration of mechanically-pumped wells within any given region (Caponera, 1954, p. 31; Nutahara, 1982, p. 62). There are even reports of pumped wells belonging to one village being installed - illegally, though with impunity - within the harim of active qanat mother wells belonging to a neighboring village. For example, farmers from Al Mouzamiya installed about 15 pumps in 1979-1980 near and within the harim of the mother wells belonging to Ruhaybah village, and though Ruhaybah elders complained to the government about this infringement on their water rights, the pumps continued to operate and both of Ruhaybah's qanats ceased flowing by 1981. Once pumped wells are installed, their use is never monitored, so that the cumulative and sustained impact of hundreds and thousands of electric and diesel-pumped wells all drawing from the same aquifer is not assessed. Traditional water laws and the village-level regulation of water shares by the mirab (an official in charge of water distribution for irrigation) need to be expanded to a regional scale, perhaps by creating a state mirab to coordinate pumping rates and otherwise regulate the use of ground-water resources throughout Syria. This imperative may be mitigated in the near future - albeit temporarily - by the conservation of surface water supplies, which are plentiful enough in Syria - at present rates of use - to compensate for a loss of ground-water; resource officials estimate that surface water resources could be stretched much farther as about one-half of the country's surface water resources are presently wasted through evaporation, leaky municipal water systems, and other inefficiencies. Qanats are being abandoned in Syria as water tables fall and qanat galleries go dry. This is not an isolated phenomenon; this same scenario is being played out in Pakistan, Iran, Oman, Morocco and many other places where qanats are still used, or have recently been in use. The effect on individual qanat-dependent communities has been a loss of local control over traditional water resources and (often) out-migration from farm communities to cities to find non-farm employment. In some cases, employment opportunities offered by urban-based industries or regional oil development provides an incentive for working age males to leave their villages. If these laborers do return, they will often work only for higher wages. These factors reduce the labor pool for qanat maintenance, leaving them prone to neglect (Sutton, 1984, p.11). Qanats now play only a marginal, diminishing role in Syrian agriculture. These features are useful in only a few limited areas, with highly localized use at each of those locales. Yet, as long as shallow, perennial aquifers are not depleted by overpumping, qanats can still be used to exploit these waters in a sustainable fashion. They could even be improved by farmers committed to sustainable irrigation by lining the susubterraneanhannel to prevent collapse and to reduce erosion and silting in the tunnel. Adding a shut-off valve would restrict the flow of water to periods when it is needed. Building a large holding tank or reservoir at the terminus would help to store the water which flows overnight and between irrigation periods. Policies designed to preserve and improve qanats are futile, however, if falling water tables are not stabilized. Achakzai, G.N. & Toor, A.S. (1990). Conservation and management of karez water in Balochistan. In: Proceedings of a National Seminar on Water Resources Development and its Management in Arid Areas. Quetta: Pakistan Water Resources Research Centre. 450 pp. Allan, J.A. (1982). Capital has not substituted for water in agriculture. In: Allan, J.A. (Ed. ), Libya Since Independence: Economic and Political development, pp. 25-35. New York: St. Martin's Press. 187 pp. Beaumont, P. (1968) .Qanats on the Varamin Plain, Iran. Transactions of the Institute of British Geographers, 45: 169-179. Beaumont, P. (1973). A traditional method of groundwater extraction in the Middle East. Ground Water, 1: 23-30. Beaumont, P. (1989). The qanat: a menas of water provision from groundwater sources. In: Beaumont, P., Bonine, M. & McLachlan, K. (Eds), Qanat, Kariz, and Khettara, pp. 13-31. Wisbech: Menas Press. 305 pp. Birks, J.S. (1984). The falaj: modern problems and some possible solutions. Waterlines, 2:28-31. Caponera, D.A. (1954). Water laws in Moslem countries. FAO Development Paper., Number 43. Rome: UNFAO. 202 pp. Collelo, T. (Ed.) (1988). Syria: A Country Study. Washington: U.S. Government Printing Office. 334 pp. Creswell, K.A. (1932). Early Muslim Architecture. Tome 1, Umayyads. Oxford: Clarendon Press. 350 pp. Dutton, R. W. (1989). Aftaj renewal in Araqi: a village case study from Oman. In: Beaumont, P., Bonine, M. & McLachlan, K., (Eds), Qanat, Kariz and Khattara pp. 237-256. Wisbech: Menas Press. 305 pp. Ehlers, E. & Saidi, A. (1989). Qanats and pumped wells -the case of Assad'abad, Hamadan. In: Beaumont, P., Bonine, M. & McLachlan, K., (Eds), Qanat, Kariz and Khattara. pp. 89-112. Wisbech: Menas Press. 305 pp. English, P.W. (1968). The origin and spread of qanats in the Old World. Proceedings of the American Philosophical Society, 112: 170-181. Evenari, M., Shanan, L. & Tadmor, N. (Eds) (1971). Tapping underground water: The chain of wells. In: The Negev: The Challenge of a Desert, pp. 173-178. Cambridge, MA: Harvard University Press. 432 pp. Fleming, D. & Barnes, M. (1993). The worldwide distribution of filtration gallery systems and the social mechanisms underlying their construction and management. Culture and Environment: A Fragile Coexistence, Proceedings of the 24th Annual Chacmool Conference 1991, Calgary, Alberta, pp. 363-369. Calgary: University of Calgary. 444 pp. Fuller, M. (1986). Abila Reports. Report on file at the American Center of Oriental Research, Amman, Jordan. 296 pp. Furon, R. (1967). The Problem of Water: A World Study. London: Faber and Faber. 208 pp. Goblot, H. (1979). Les Qanats: Une Technique d'Acquisition de l'Eau. Paris: Mouton. 231 pp. Huntington, E. (1945). Main Springs of Civilization. New York: John Wiley and Sons. 660 pp. Keilany, Z. (1980). Land reform in Syria. Middle Eastern Studies, 16: 209-235. Kobori, I. (Ed.) (1980). Qanawat Romani of Taibe Oasis. Tokyo: University of Tokyo, Department of Geography. 98 pp. Kobori, I. (1990). Les qanat en Syrie. In: Geyer, B. (Ed. ), Techniques et Pratiques Hydro-Agricoles Traditionnelles en Domaine Irrigue, Tome 2, pp. 321-328. Paris: Librairie Orientaliste Paul Geuthner. 521 pp. Kobori, I., Takahasi, Y. & Kawano, S. (1980). The water system ofTaibe Oasis. In: Kobori, I. (Ed. ), Qanawat Romani of Taibe Oasis, pp. 53-82. Tokyo: University of Tokyo, Department of Geography. 98 pp. Lewis, N .N. ( 1949) .Malaria, irrigation, and soil erosion in central Syria. Geographical Review, 39: 278-290. Lightfoot, D.R. (1996). Moroccan khenara: Traditional irrigation and progressive desiccation. Geoforum, 27: in press. Lightfoot, D.R. Qanats in the Levant: Hydraulic technology at the periphery of early empires. Technology and Culture, in press. Moussly, N. (1951). Le Probleme de l'Eau en Syrie. Lyon: BOSC Freres. 290 pp. Nutahara, N. (1982). Arabic terminology pertaining to water in the Syrian desert. In: Kobori, I. (Ed. ), Case Studies of Foggara Oases in the Algerian Sahara and Syria, pp. 53-65. Tokyo: University of Tokyo, Department of Geography. 98 pp. Reifenberg, A. (1955). The Stntggle Between the Desert and the Sown. Jerusalem: Government Press. 140 pp. Ron, Z.Y.D. (1989). Qanats and spring flow tunnels in the Holy Land. In: Beaumont, P., Bonine, M. & McLachlan, K. (Eds), Qanat, Kariz and Khettara, pp. 13-31. Wisbech: Menas Press. 305 pp. Russel, A. (1794). The Natural History of Aleppo. London: G.G. and J. Robinson. Safadi, C. (1990). La foggara, systeme hydraulique antique, serait-elle toujours concevable dans la mise en valeur des eaux souterraines en Syrie? In: Geyer, B. (Ed. ), Techniques et Pratiques Hydro-Agricoles Traditionnelles en Domaine Irrigue, Tome 2, pp. 285-293. Paris: Librairie Orientaliste Paul Geuthner. 521 pp. Sandstrom, G.E. (1963). The History of Tunnelling: Underground workings through the ages. London: Barrie and Rockliff. 426 pp. Sauvaget, J. ( 1939).Remarques sur les monuments Omeyyades. Journal Asiatique, 1939: 1-60. Simarski, L.T. (1992). Oman's 'unfailing springs'. Aramco World, 43: 26-31. Sourdel, D. (1968). La Civilisation de l'Islam Classique. Paris: Arthaud. 673 pp. Sunon, S. (1984). The falaj: A traditional cooperative system of water management. Waterlines, 2: 8-12. Tresse, R. (1929). Irrigation dans la Ghouta de Damas. Revue d'Etudes Islamiques, 4: 459-474. Programming and Design by Moki Systems, a Utah Ruby on Rails consultancy with content provided by USBR Provo Area Office.